On paper, this gas grill has what it takes to be good in the price range. The four burners pump out plenty of power under the 461 square inches of porcelain coated cast iron cooking surface. Aside from this, there is nothing else here other than a bottle opener on the left side table. This is bare bones, and the makers know it, but for the price, it is one of the better gas grills on the market, but don't expect it to last for more than a few years. Home Depot ended its relationship with Char-Broil in 2014 and turned to Brinkmann to supply them with an endless array of cheap and basic gas grills. Then, in 2015, Brinkmann went bankrupt (which isn't a real loss to the industry), and Home Depot was left with a big hole on their showroom floor. This hole is now being filled by the GHP Group, an importer of Chinese products for the US market. This brings us to this gas grill. It is stripped down to the very limit of what a gas grill can be. Home Depot goes so far as to point out in the name of this grill that it sits on an "open cart." That means that this is a grill on four legs with a little piece of sheet metal covering the front. It can't be surprising how basic this grill is considering the well under $200 USD price tag and the 66-pound weight. Everything on this grill is thin and simple. And yet, this is a four burner gas grill that pumps out 48,000 BTUs under 461 square inches of porcelain coated cast iron cooking space. That gives it a good heat output for the size, so this will do a good job cooking. On the other hand, the thinness of the materials means a short lifespan and the very simple design will mean flare-ups and uneven heating. 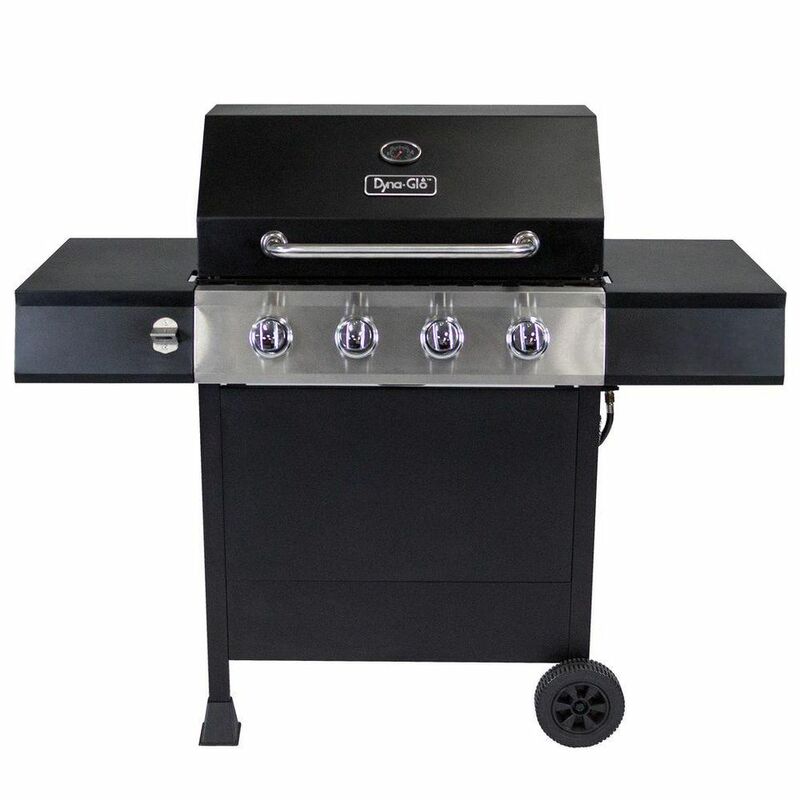 This is a "you get what you pay for" grill at a very low price, and yet a grill that is more powerful than most of the competition and better built that many of the products Home Depot has relied on in recent years. Don't expect this grill to last, but for the price and size, there isn't a lot that can beat the ​Dyna-Glo 4-Burner Gas Grill.